This is the 6th year of this very enjoyable get together for both the members and the footballers. I thought we had a particularly strong side this year but just got pipped to the post and lost the match 5-4. We had some tremendous performances from Glenn Hoddle, Ray Houghton, Sir Trevor Brooking, Paul Walsh, Lee Hendrie and Liam Brady but unfortunately we just got beaten again. We are currently 4-2 down on this annual event but the footballers are very keen to return to the glorious Old Course at Burhill next year to secure that elusive win and get us closer to the home side. If you would like to run a similar event against your club, get in touch! 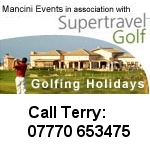 Email/call Terry Mancini terry@mancinievents.co.uk 07770 653475.